Blood oranges—also called blush oranges and Maltese oranges, among other names—are in high season now. We look forward to them all year, contenting ourselves with the excellent bottled blood orange juice from Italian Volcano (organic and kosher) when we can’t squeeze our own. 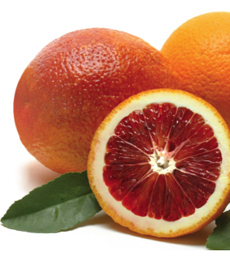 Blood oranges are believed to be a mutation of the sweet orange that occurred in Sicily, around 1850. It was brought to the U.S. by Italian immigrants and now grows in California and Florida. With growing popularity, blood oranges are planted in different areas of the orange belt. They are harvested from October to January in Florida, from December to March in Texas and from November to May in California. There are three types of blood oranges. You can learn more about them; then scroll to the bottom of the page for related cooking videos. The “blood” color comes from a red pigment and powerful antioxidant called anthocyanin. * The hue can range from red to rose to deep purple, depending on the climate where the oranges are grown. Blood oranges are also packed with high levels of carotene, dietary fiber, potassium and vitamin C.
blood oranges for yourself or as gifts. *Anthocyanin neutralizes the effects of free-radical chemicals that are believed to cause cancer and other ailments (diabetes, epilepsy, heart disease, liver disease and ulcers) plus the general impact of aging. Research shows that they fight and preventing cancerous tumors and ulcers, and improve vision. Check out these blood orange recipes.